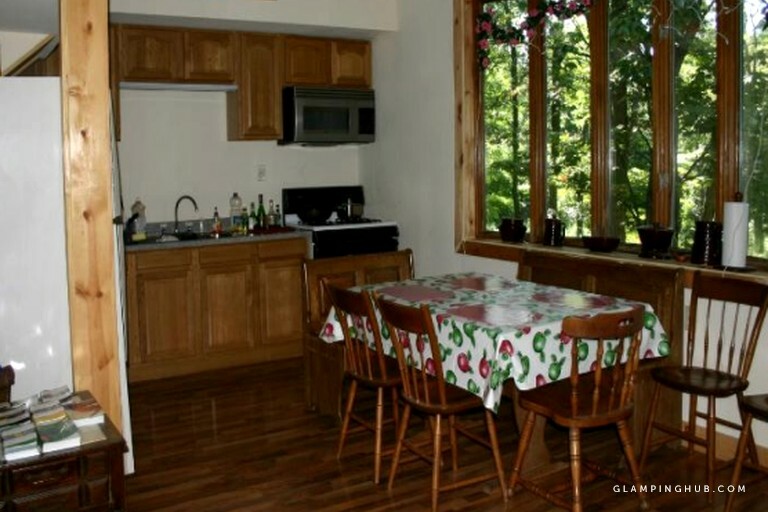 This spacious three-bedroom property will comfortably sleep up to 15 guests and makes the perfect rental for a family looking to get away and enjoy a vacation near Lake Chautauqua, New York. The cabin boasts a large master bedroom complete with a master suite complete with a luxurious king-size bed and its very own Jacuzzi bathtub. The remaining glampers are accommodated across the other two bedrooms that are furnished with a combination of bunk beds and doubles. Guests will find a fully stocked kitchen, complete with a fridge-freezer, microwave, stove, and toaster, perfect for an easy self-catering vacation and the open plan living area has a large dining table, perfect for preparing large family meals. 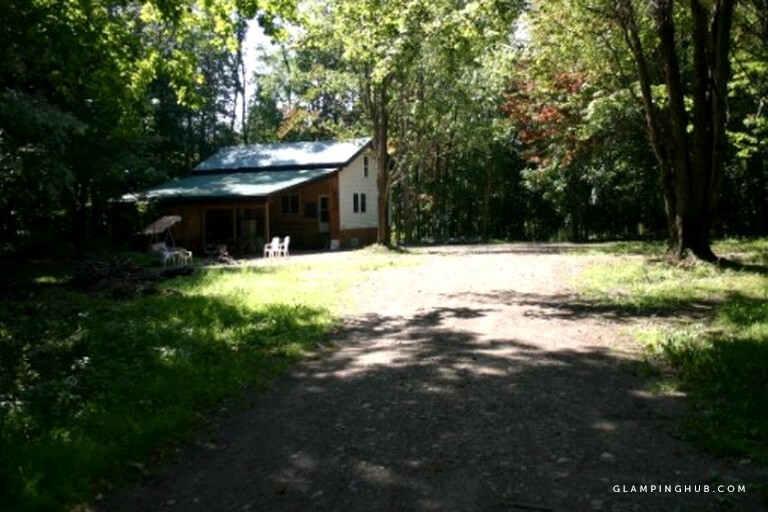 Glampers will have access to plenty of off-street parking at this glamping accommodation with ample space for cars and recreational vehicles as well as space for outdoor camping if desired. Guests will find the home fully furnished and equipped with all linens, bedding, and towels and there is a washing machine and clothes dryer provided for all guests laundry needs. 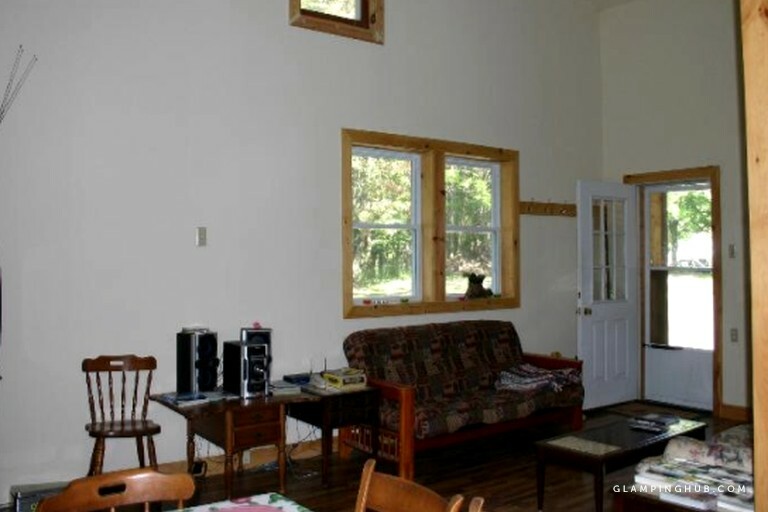 Wi-Fi internet access is available throughout the property as well as a telephone so glampers can always stay in touch, and the entertainment suite includes a television with DVD and video player and music sound system. 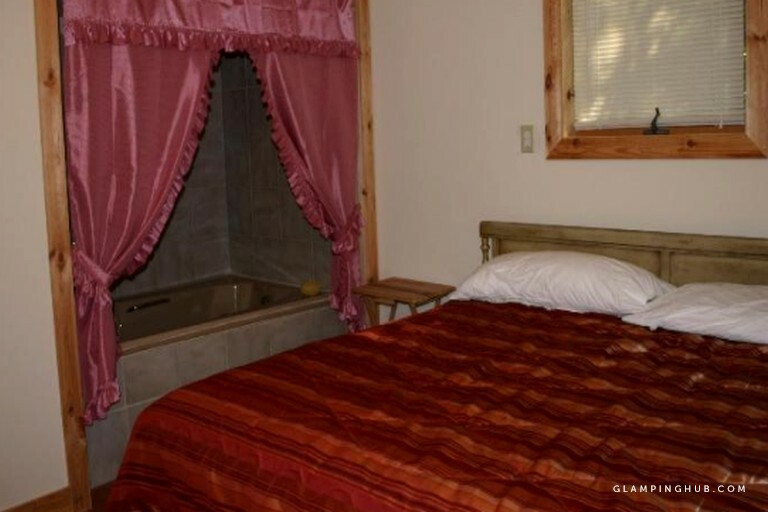 The cozy home is fully central heated to ensure guests are always warm and there is a fantastic Jacuzzi hot tub to enjoy out on the deck area as well as a natural gas barbecue grill. 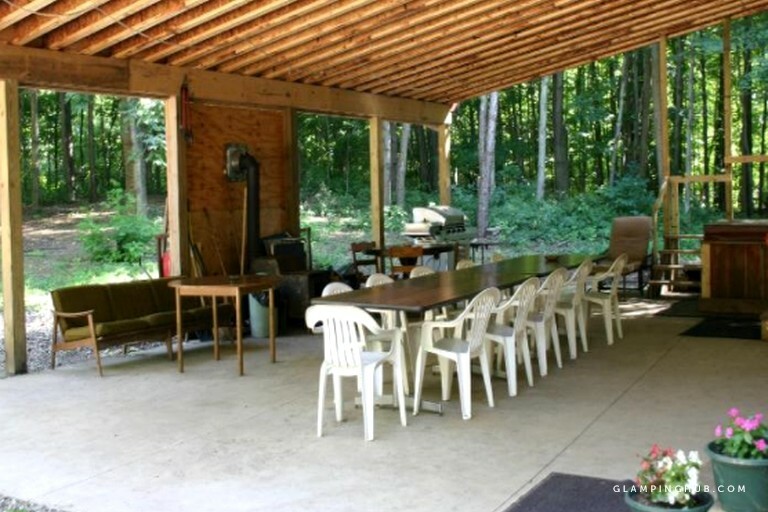 When staying at this amazing destination, glampers will be able to enjoy all number of water sports and leisure activities by the lake's edge and the area is very popular with anglers as the cabin makes a perfect location for a fishing base camp. Many guests enjoy taking a tour of the local wineries, leisurely walks in the spring and summertime, or hiking through the hillier areas. In the winter, glampers will be able to enjoy snow sports such as snowmobiling. 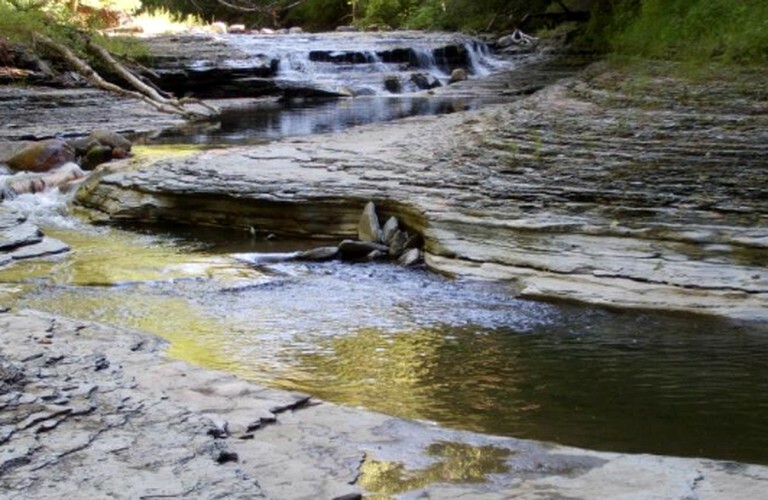 Many visitors to this area just come to enjoy a leisurely break from the daily grind and taking a nice relaxing vacation to enjoy the lakeside, swimming, sunbathing and playing in the freshwater beaches. Glampers should note that smoking is strictly prohibited in this accommodation. 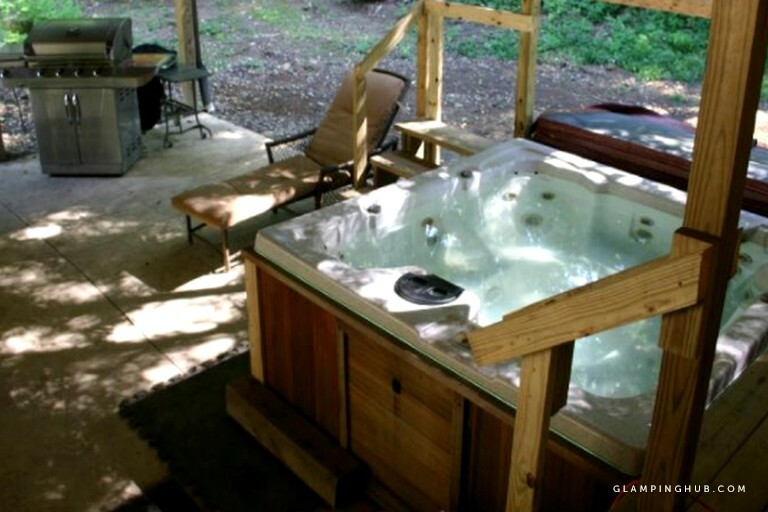 Between the months of November through to April the hot tub is not available for guests to use. A refundable deposit of $100 is charged.